Are you following too many people on Twitter, or finding your timeline unruly and hard to keep up with? If so, you may have the Twitter overload blues. This happens to many Twitter users, but there’s a way to cure this problem: Use lists both to organize the accounts you follow and to use Twitter more efficiently. When you follow people on Twitter, they get added to one long list of accounts. Your timeline contains all the tweets (and retweets) from all those accounts. But you can create lists to organize the accounts you follow and view each list individually, cutting down the density of your timeline. It’s easy to create a new list on the Twitter website. 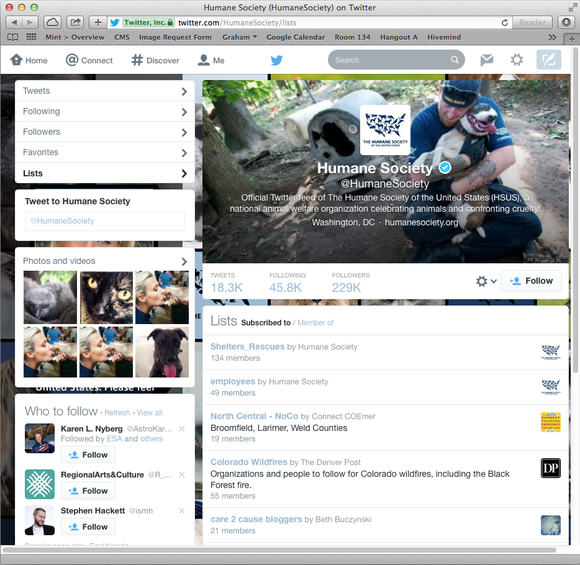 Create a list: You can view and edit lists from the Twitter.com website. Log in, then click the gear icon near the top of the window and choose Lists from the pop-up menu that displays. To create a new list, click the Create List button. Give the list a name, and a description if you want, then choose whether you want it to be public or private. The only difference between public and private is that anyone can see who is a member of your public lists. If you’re making a list of friends, you might want to keep it private. But this has no effect on who can see their tweets. If there are accounts you want to follow just for information—say about breaking news or a particular event—add them to a list instead of following them. Add people to your list: Save the list, then search for users—by username, first name, and so on—to add to it. This process can be slow if you follow a lot of Twitter accounts, but there are some shortcuts. 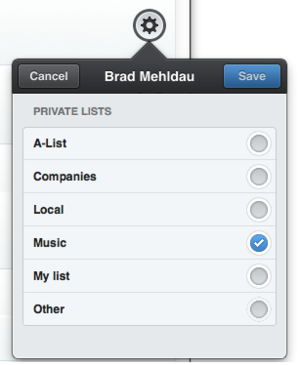 For instance, if you’re already looking at a person’s user page, click the gear icon and choose Add or remove to lists. In the Your Lists window that appears, select any list you want to include the person in. Watch List limits: Be aware that Twitter limits you to 1000 lists, and that no list can have more than 5000 users. List names can be no longer than 25 characters, and they cannot begin with a number, so you can’t have 1-List, 2-List, and so on. 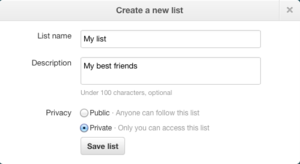 Add people to lists without following them: You can add people to Twitter lists even if you don’t follow them. This is very useful if, for example, you want to follow certain accounts just for information—say about breaking news or a particular event; you can add them to a list instead of following them. 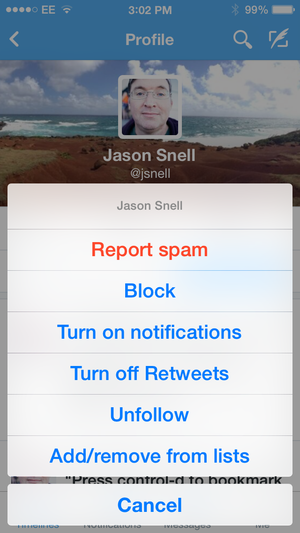 Then, you can use your regular timeline, without those accounts, for your main Twitter action. Manage list memberships with Twitter’s iOS app. Rather than go to the Twitter website, many people like to view their feed in an app that sits in their menu bar or Dock. Unfortunately, you can’t work with your lists using the official Twitter client on OS X, but many other apps give you that option, including Twitter’s iOS app. Tap a user’s icon, then tap the gear icon and choose Add/remove from lists. Likewise, with Tapbots’s $20 Tweetbot for OS X, you can find someone you follow, click on the gear icon next to their name, and choose which lists you want to add them to. You can include a Twitter account in multiple lists, if you like. Many Twitter clients support lists, so check your preferred client to see if it does, too. Manage list memberships with Tweetbot. Twitlistmanager: If you follow a lot of people and end up with a lot of lists, you might want to try a website such as Twitlistmanager, which lets you easily manage lists. After you sign in with Twitter—granting Twitlistmanager the ability to access your account—you’ll see a matrix of the accounts you’re following and your lists. Adding or removing users from lists is as easy as checking or unchecking boxes and then clicking Save Changes. When I created lists with Twitlistmanager, it sometimes created two or three with the same name, confusing matters. I found it easier to create the lists on the Twitter website and manage them from Twitlistmanager. But adding members to your lists is quick and easy with this site. You can even use the “toggle unlisted friends” feature so that only those accounts not yet in lists show up. You can also follow lists that others have set up, if those lists are public. For example, there is a list of Macworld staff, and another of Macworld contributors that you can subscribe to if you don’t want to follow each person individually. Click on either of the links above, then click Subscribe to add that list to your Twitter account. If your friends or colleagues have their own Twitter lists, you can subscribe to them, too. Click on a profile and then click on Lists. Click on a list you’re interested in, and then click Subscribe. You can subscribe to lists made by other people or organizations that you're interested in. Once you’ve set up your lists, you’ll want to choose the best way to view them. Just about every Twitter client lets you view lists, as does the Twitter website. On the site, click the gear icon, then choose Lists, and you’ll see a list of your lists; click one of them to see tweets from its members. Different apps display lists in different ways, but they all use a similar icon that looks like a stack of three lines. When you click that icon, you’ll see your lists, and you can click one to see its tweets. Twitterrific for OS X takes a different approach, putting the lists in its sidebar. Click a list’s name to see its tweets. When you have multiple lists, you’ll probably be switching among them during the day. I have one list with friends and colleagues that I follow most of the time. I have others for companies I follow, local businesses, music (artists and labels), and other. I check them occasionally, but since I don’t generally interact with those accounts, I don’t care about seeing what they have to say in real time. 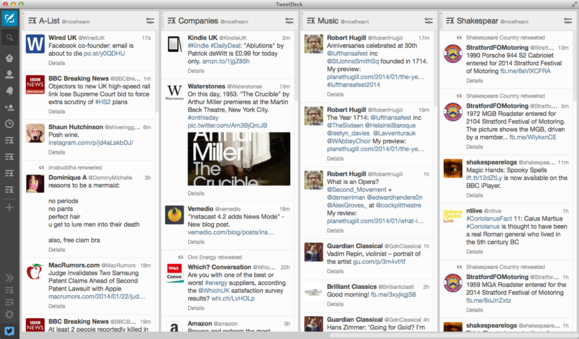 Several OS X Twitter clients let you view multiple lists in columns. If you want to follow more than one list live, this is both practical and handy. Several OS X Twitter clients let you view multiple lists in columns. If you want to follow more than one list live, this is both practical and handy. For example, if you have a list for friends, and another for work, you may want to keep both visible. Twitter’s free TweetDeck and Tweetbot both offer multiple-column views, as do some other clients. Twitter's free TweetDeck presents lists in vertical columns. So if you need to wrangle your Twitter feed, try using lists. You can split up the accounts you follow by category, and not be overwhelmed by too many tweets in your timeline. It takes a while to set up, but you may find that it makes your life on Twitter a bit easier. Updated at 9:51 ET on 1/22 to correct the price for Tweetbot for OS X.